Sunday afternoon at New Era Field the Bills host the Chicago Bears. Second year quarterback Mitchell Trubisky continues to progress for the Bears. ORCHARD PARK, N.Y. (AP) -Bears coach Matt Nagy need not worry about any R-rated remarks that might have been picked up by the microphone he wore in a win over the New York Jets last week. "Is it good or bad?" asked Nagy, who had forgotten he was miked up in the first place for a 4 1/2-minute segment posted on the team's website this week. "Good? I hope so," he said. "I know there could be some bad stuff on there." 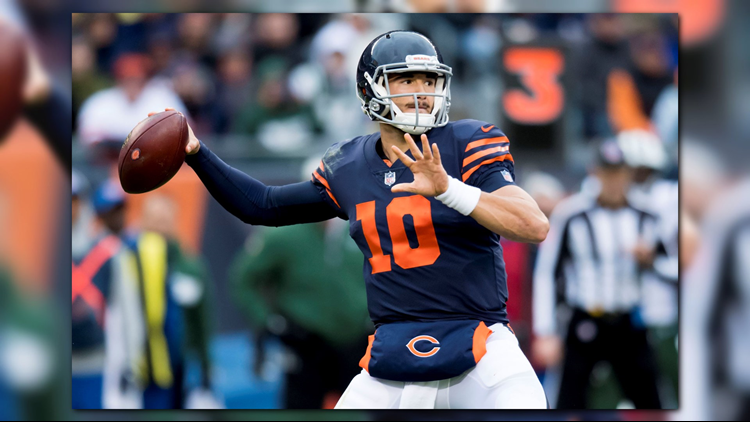 Nagy generated rave reviews, with the series of clips shedding further light on how the first-year coach has spurred second-year quarterback Mitchell Trubisky's development as the Bears travel to play the Buffalo Bills on Sunday. "I'm going to challenge you right now these two quarters for greatness," Nagy told Trubisky on the sideline at halftime. "You take this thing over right now." Trubisky responded by overseeing three consecutive scoring drives in which the Bears turned a 7-3 lead into a 24-10 win. He called the pep-talk inspiring. "When he says that, I think it just makes us more goal-oriented," Trubisky said. "I think it really just honed me in, made me focus more." Trubisky has been on a roll. His 1,814 yards passing in seven games are 379 yards shy of his total in 12 games last year. He has been especially sharp the past four games with 1,233 yards passing and 13 touchdowns — the most over that span for Chicago since Sid Luckman in 1947. Coupled with an opportunistic defense, which ranks second in the NFL with 17 takeaways, the Bears (4-3) are off to their best start in five years. The Bills (2-6), by comparison, are off to their worst start since 2010, and coach Sean McDermott has had difficulty coaxing much out of a patchwork offense. They haven't scored a touchdown in two games, and managed just 87 points all season. And now Buffalo faces the prospect of starting turnover-prone Nathan Peterman on Sunday, with rookie Josh Allen (sprained throwing elbow) ruled out for a third consecutive week, and Derek Anderson dealing with concussion-related issues. This would mark Peterman's second turn at starting this season, and after he went 5 of 18 for 24 yards and two interceptions through two-plus quarters of a 47-3 season-opening loss at Baltimore. "I'm thankful for all the opportunities I've been through, all the lessons I've learned, and ready to be better from them," said Peterman, who has 10 interceptions in 84 career passing attempts, including a brief playoff appearance. "I'm going to go out there and do my best to get us a win." Receiver Terrelle Pryor is in position to make his Bills debut five days since signing with Buffalo, and 10 days after being released by the New York Jets. After saying he felt "underused" during his six-game stint in New York, ending with a groin injury, Pryor is confident he make an immediate impact in Buffalo. "I expect high things from myself, and I expect high things from the offense," he said. "Just because we lost some games doesn't mean we can't win or can't put things together. I believe." The Bears have a big hole to fill at right guard after Kyle Long hurt his foot last weekend. Eric Kush or rookie James Daniels, who have split time at left guard, are candidates to fill the job. Another option is Bryan Witzmann, who signed three weeks ago. Witzmann started 13 games last season in Kansas City, where Nagy was the Chiefs' offensive coordinator. Khalil Mack's return to Buffalo is up in the air with the Bears star pass rusher's status uncertain due to an injured right ankle. Mack emerged as a star during a four-year career at the University at Buffalo, which was the only Division I school to offer him a scholarship. He went on to be selected fifth overall in the 2014 draft by the Raiders, before Oakland dealt Mack to Chicago before the start of this season. Nagy wasn't surprised to see Bills running back LeSean McCoy taking a few snaps in the wildcat formation during a 25-6 loss to the Patriots on Monday. "He's done that going back to Bishop McDevitt in Pennsylvania in high school," Nagy said. "I got to see him do it." Nagy was an Eagles assistant coach when Philadelphia drafted McCoy in 2009. McCoy declined to speak to reporters after Buffalo's first two practices this week since expressing his frustrations after managing just 13 yards rushing against New England. Though he had a season-best 82 yards receiving, McCoy managed 1 yard on his final 11 carries. He has not scored in nine consecutive games dating to last season, since scoring a TD rushing and receiving in a 24-17 win over Miami on Dec. 17.